With several thoughtful and gorgeous floorplans that include customizable options and high-end finishes, homebuyers enjoy between 499 – 650 square feet of living space. These tiny homes pack a powerful punch in each square foot optimizing use of space and livability. Despite the fact that the cottages are considerably smaller than the average home, current Simple Life homeowners enjoy full-sized kitchen appliances, stackable washer and dryers, one and two bedroom options, flex space, and in some models, an additional 160 square foot loft ideal for visiting grandchildren or extra storage. McCann and his team held several meetings with members of the Lake Association (Lake Andrew) helping the community understand the quality and aesthetics of Simple Life in Wildwood. “They embraced our vision and give us full support knowing we are community partners,” said McCann. Simple Life will begin site work in June with anticipation of presales to begin in July. As visionaries and a company that is committed to providing homebuyers with a place they are proud to call home, Simple Life’s team is enthusiastic about moving into the Ocala area and developing a community that will enhance the current landscape. About Simple Life: Simple Life is excited to be paving the way for people wanting to live in an award-winning tiny home community. Tiny homes in Simple Life communities start in the low $100s and include use of community amenities that are specific to each development but include a pool, fitness center, internet café, yoga room, dog park, and outdoor gathering spaces. For more information about living a simpler life in our communities contact our Simple Life Concierge at 828-707-0969, email us info@simple-life.com or visit us on the web at www.simple-life.com. Will there be an area for tiny houses on wheels, commonly called towables, like there is in NC? At this time our Ocala community is not slated to have a tiny towable area. I own a tiny home at Simple Life in Flat Rock and have been very pleased with the community. I also have a place in Pensacola but have been considering downsizing and moving farther south. I plan to be heading down to S. FL in March. Please provide an address and I will swing thru to check out your proposed community. Thank you. We’re glad you love your Flat Rock tiny home! We will just be beginning to break ground in March, but we would love to welcome you back later in the summer when the grounds are available to walk. That’s excellent I’m glad you’re sitting with Presidence. now if they would go one step further and allow people to have their tiny homes stay on wheels then we are really making progress. Are park we are in currently in is one of those rare year-round parks we’re all the residents pay for a space yearly. Also inquiring if you need management people 2 be sight assisting with the residents the grounds, office and all the other activities. My partner and I are looking for a permanent position in a community such as this. Let me know if there is any opportunity at this one that you will be breaking ground on in March? Thank you for your letter and your interest in Simple Life tiny home communities. We are excited about the approval from the City of Wildwood and we look forward to our newest location. We will have a dedicated staff at the new community attending to operations, maintenance, and resident satisfaction. We haven’t begun soliciting applications yet, but we anticipate starting that process in the Spring and Summer of 2019. We will keep your information and note your interest, please keep an eye out for more information from us later this year. If you would like to join our email community to receive exciting updates and developments, we encourage you to email info@simple-life.com or call (828) 707 – 0969. Bedrooms are located on the main living area with loft options available for additional living space or storage opportunities. Our current tiny home offerings range from 400-500 square feet. So glad to hear! We are in the process of finalizing details of the new community, but we’d be happy to provide more information as it becomes available. Please email info@simple-life.com to be added to our database so that we may provide news and updates about the new Florida community! Are there any garage/storage space? Will love seeing this development. Very interested. The Wildwood, FL community is currently in the early stages of development and details are still being finalized. However, our current communities allow for a 6 x 6, 8 x 8, or 10 x 10 shed on each homesite and we anticipate that Wildwood will offer the same outdoor storage solution. What other areas of FL are you looking to build? Simple Life is exploring Central Florida including Ocala to Leesburg and East to Deland and Daytona areas as well as South West Florida including Punta Gorda, Port Charlotte, and Fort Myers areas as potential places for our Florida communities. Love tiny homes! Interested in Wildwood site, as I already live in a neighboring community. Looking forward to checking out your site and also your model homes. 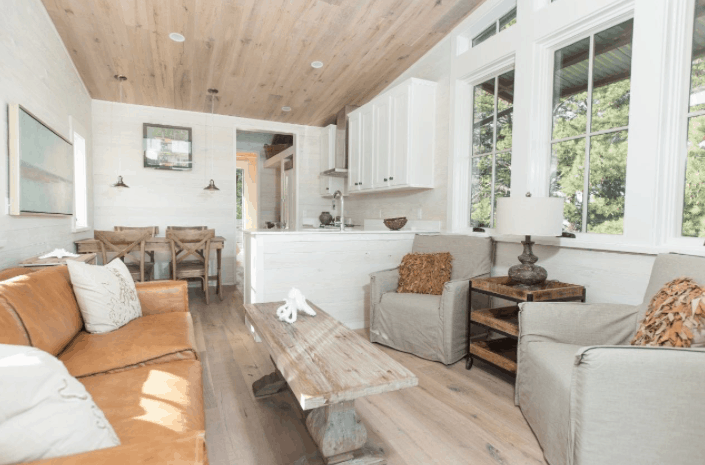 Yes, Simple Life can help secure financing for our tiny homes through third-party lenders. Buyers will meet with our finance manager to assess which lender is best for specific needs. Thanks!